It makes sense to say that spice is the spice of life. Pickled jalapenos in gravy is a good way of living by that mantra 100%. Those customers who like it hot will like this schnitzel! Prepare the chicken breast with a meat mallet. Fry until cooked through and golden. Drain. Combine the jalapenos with the water, whisk in the KNORR Gluten Free Rich Brown Gravy and whisk until boiling. Combine the cream, cheese and KNORR Chicken Booster together and heat gently. Chop and grill the bacon. Slice the onions thinly and fry at 160 degree Celsius until golden, drain and set aside. 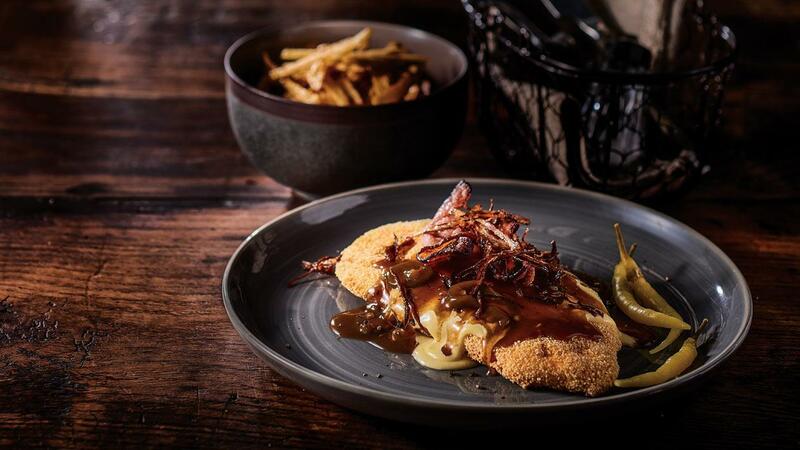 Serve the schnitzel with jalapeno gravy, cheese fondue, bacon and garnish with the tobacco onions.